"Automated Call & Lead Scoring for Today's Call Center"
Today’s call center is not lacking data. But the manual process of analyzing voice recordings in search of business opportunities is labor intensive and costly. And it takes time— time that could be better spent exploiting new-found insights to improve business processes. By replacing human call scoring with an automated call solution offered by contact centers, call-tracking services and hosted PBXs can save a considerable amount of time and money. Your clients will be interested in a solution that accelerates the call-scoring process, saves money, and enables a new level of intelligence to be gleaned from customer calls. VoiceBase Predictive Analytic is just such a solution. Automatically mining the rich data in spoken interactions opens the door to a wealth of possibilities. 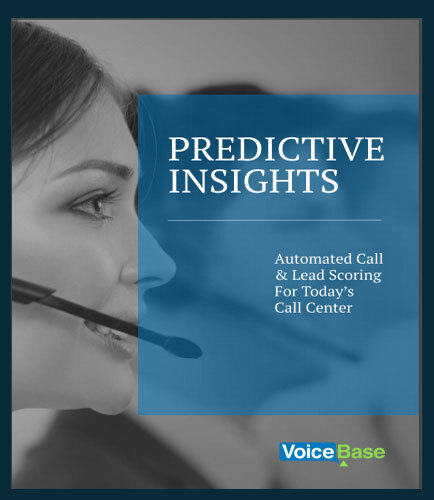 Read this whitepaper for predictive insight on automated call & scoring leads for today's call center systems.